I'm so excited to share one of my very first client projects! To give you quick re-cap on my blogging and designing journey, I used to be a full time graphic designer up until earlier in 2018 when I decided to pursue my styling and blogging gig full time! So, here I am sharing my first professionally shot space (well, I photographed it but you get the picture!). My client has a very fresh and modern style and had recently purchased this home which had a mix of modern and traditional finishes. The powder room was her least favorite space and we both knew it would be a good place to start. We only made basic aesthetic changes but boy oh boy, did it make a difference! Even though this room has no windows (which makes it very tricky to photograph! ), adding that amazing Serena & Lily wall paper immediately brightened it up and made it feel so happy and fun! 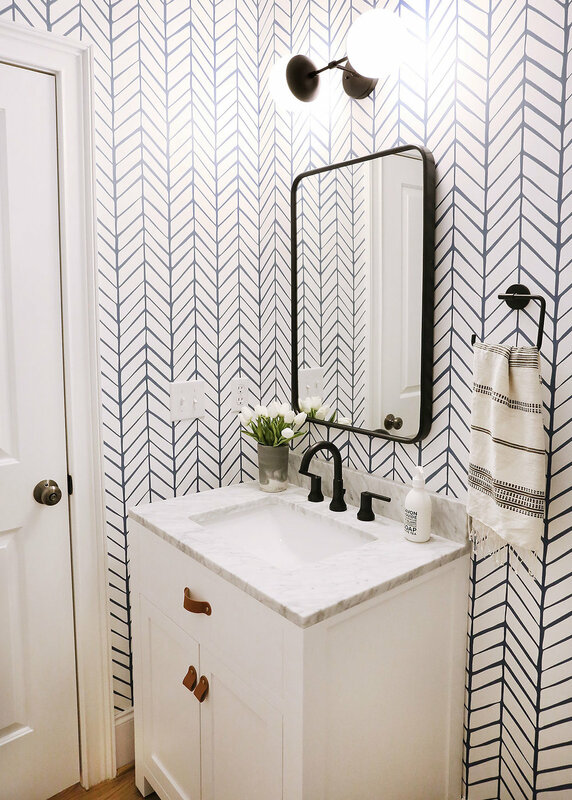 I've had such great luck with pre-made vanities from Wayfair lately, that I sourced this modern one and it did not disappoint! The marble was stunning and the shaker style cabinets were just the right mix of simple and modern. We swapped out the silver hardware for these leather pulls and handles from CB2 and I think that might be my favorite detail. They make the vanity feel way more custom than it actually is! And to me, you can never go wrong using leather. 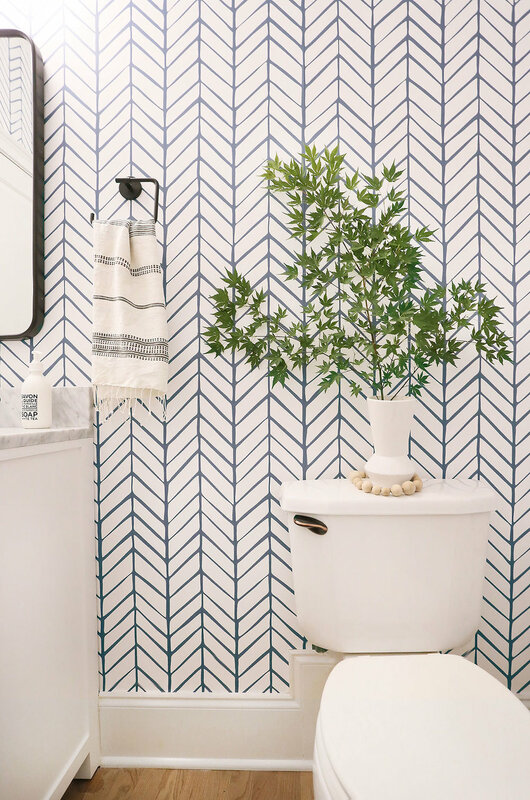 I knew the wallpaper was going to be a STATEMENT (a very good one, but still strong!) and I love how that beautiful Big Sur print from Jenny's Print Shop softens all the graphic angles and grounds things a bit. Pictures of oceans just go in bathrooms, right?! And speaking of natural elements, I had my client's husband clip off a large branch of a Japanese Maple tree from their front yard and added that to a vase. It adds impact, life and again softens all those angles. Plus, I never realized that the leaves from a Japanese Maple look like pot leaves! The matte black faucet from Delta was soo perfect and soo affordable. I am definitely planning to use one of those in my home! Love the quality! And that awesome rounded corner mirror came from my go-to spot for all things home, Rejuvenation. 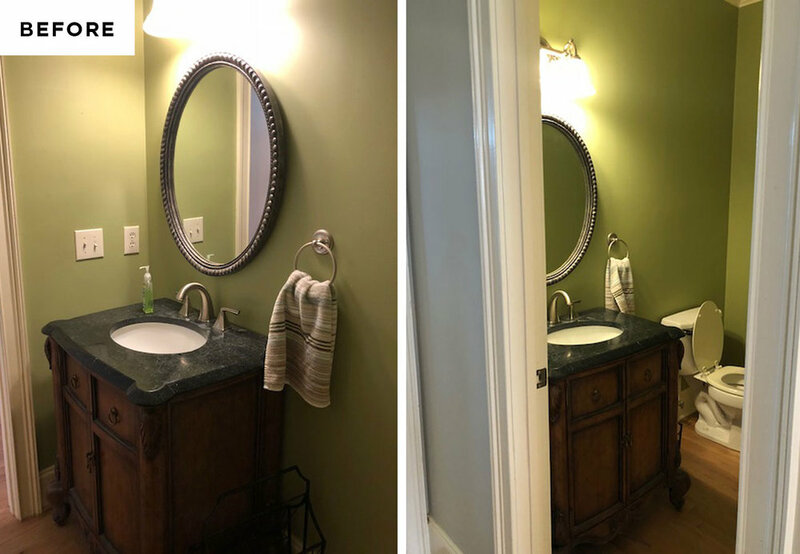 I loved how this little bathroom came together! What do you guys think?